The BB Cream does have good power control. Although tetep using that day is still a good result, instead of oil in our face when it's mixed with this Atomy so it felt very natural. BB Cream works like foundation then that he's pretty durable in controlling oil. As the name suggests, this BB Cream is a special formula for oily skin and acne, so it is reasonable if it includes a list of bb cream that has a potent power in controlling oil. Lioele Triple powerful this is indeed already known to control the oil, but if you have extremely dry skin, BB Cream is better to avoid this because it will make the skin look so cakey and cracked. The BB Cream has power control oil suitable for oily skin, but surprisingly even so, BB Cream is also ideal for those whose skin is really dry. So it's like Missha M Perfect BB creamnya million people, hehe. The average person would have been made and satisfied at the outcome. According to our most powerful tool for the control of oil to 6 above products are Atomy and Lioele, Lioele just more matte than Atomy results. 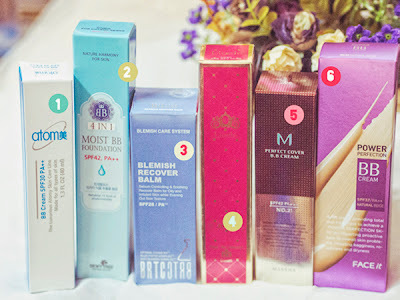 To The Face Shop and Missha although not as efficacious Atomy, Lioele, Dewytree BRTC 4 in 1 and in terms of oil control but also has oil control power is pretty good compared to the average BB Cream.